Home Your savings Why conserve water? Why AquaClic watersavers? 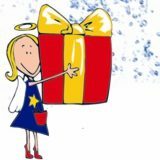 and why it is much more than a 'gadget' or 'giveaway'. Tell the truth: do you really think your faucet looks attractive? 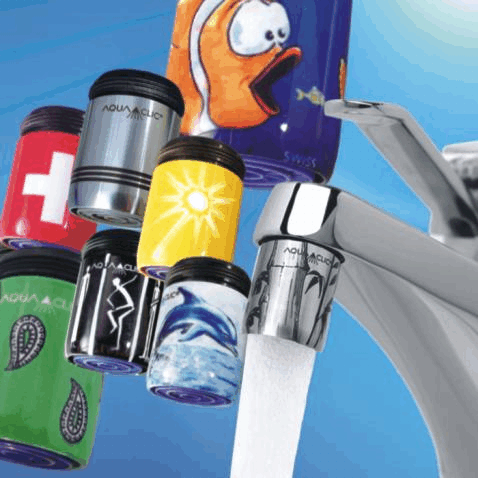 Available in various designs and materials, AquaClic water savers lend a refined look to any water faucet with their eye-catching appearance. 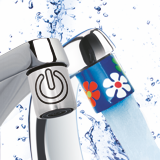 All while using up to 50% less water, cutting your utility bills and saving energy and CO2 emissions. AquaClic is also the clear number 1 when it comes to ease of use. Buying a cheaper product can mean hours spent trying to understand thread dimensions and thread types. Thanks to the included universal adapter, the AquaClic easily fits any standard faucet – even in Madagascar. If you don't have a standard water faucet – as can often happen in England and Japan, or in the case of a few modern or very old faucets - we'll quickly send you a special adapter at no cost, even if you're in Japan. The AquaClic water saver will pamper you with its soft flow, which doesn't spray. This is thanks to its sophisticated technology (flow restrictor with pressure compensation), which cheaper low-flow aerators – for instance simple flow regulators – simply don't offer. Naturally, the AquaClic also boasts 10x less calcification compared to these cheaper devices with metal mesh. Besides the typical roughly 50% that other flow restrictors also save, with AquaClic you can individually configure your flow rates. By way of example, with a flow rate of 3 l/min (0.8 gal) you'll still enjoy a comfortable stream of water, but will conserve 70-80%. Generate awareness, educate, have fun: no other water saver can do this! 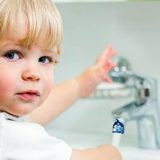 With its colorful, eye-catching or discreetly elegant designs, AquaClic reminds both children and adults of their shared responsibility to conserve water and energy. Several times a day. AquaClic is environmentally certified to ISO 14040. During its minimal 12-year service life, you'll save 30,000 times more water and energy than was used to manufacture it. AquaClic water savers are manufactured using renewable energy generated in the Swiss mountains by Repower. We manufacture all AquaClics, packaging and documentation in Switzerland. Individuals also have a 30-day money-back guarantee that allows them to test AquaClic water savers in the comfort of their own home and without risk. While other manufacturers offer no guarantee (often the case with cheap low-flow regulators from far away) or offer a 2-year product warranty, with AquaClick you get a 3-year guarantee. Ever given anyone a plumbing device as a gift? Virtually no one would get the idea to give someone a flow regulator as a gift. But with AquaClic you can! The numerous designs and materials make each one a unique and meaningful gift item: for friends and family as well as for business customers. Discover an appealing new advertising space. 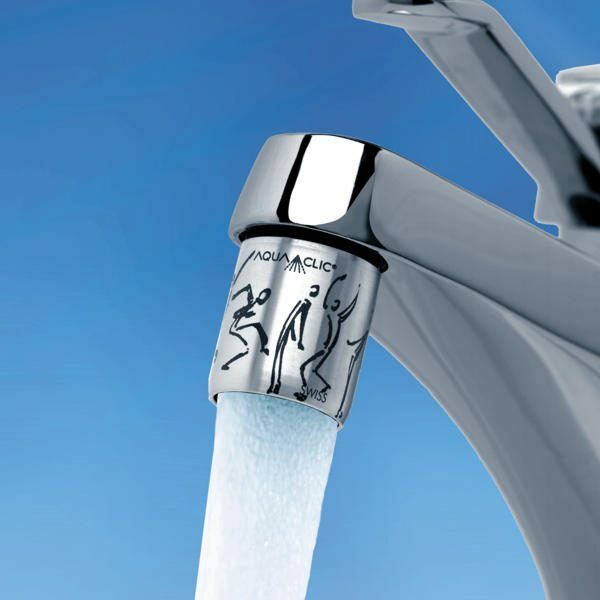 AquaClic offers this as well: humorous, discreet or eye-catching, featuring your logo or community's coat of arms. The only advertising medium that arises in environmentally sound manner and actively protects against climate change, it also helps lend your business a modern, contemporary image. usually found on other lockable flow regulators. We recommend the theft-proof AquaClic to thwart 'souvenir hunters' in hotels, schools, sports and events centers. Because you'll want your AquaClics to keep saving energy and water for years to come! Still have questions? Our own in-house customer service would be happy to answer your questions about conserving water, in any one of 5 languages. There's only one question we can't help you with: Why should you buy any other water saver than an AquaClic®? 699 Warum klebt der Duschvorhang?